Cyprien O. Mailloux, AIEE President, 1913 - 1914, the editor of Electric World, and supported the standardization of technical terms. Mailloux was AIEE president from 1913 to 1914. 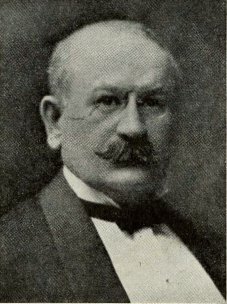 Cyprien O'Dillon Mailloux, a charter member of the Institute and active in its affairs until his death, October 4, 1932, was among that group of pioneers in the industry which laid the foundations of electrical engineering practice and followed its development closely up to recent years. Doctor Mailloux was born at Lowell, Mass., in 1860. At an early age he went to New York City where, in pursuit of professional learning, he was one of the leading pupils of Dr. M. I. Pupin, at that time a lecturer on advanced theory of electrical engineering at Columbia University. Following graduation, Doctor Mailloux entered upon his career as a consulting electrical engineer, continuing in this capacity until his death. His application for transfer to the grade of Fellow in 1912 gives some idea of the remarkable range of his activities. This application states that in the preceding period of 25 years he had the direction of electrical work in over 800 jobs, ranging from 50 to 25,000 kw or more, including special design of apparatus and machinery in hundreds of cases, and that he had made at least 100 original inventions, over 30 of which had been patented. It also was stated that he had done expert work, and submitted testimony, reports, and arbitrations in over 1,000 cases, and had published several dozen original papers and articles. In addition to having been president, Doctor Mailloux served the Institute as manager 1886-89, 1905-07, and 1899-1902. He also had served as vice-president 1898-99 and 1902--04. He had served on 5 of the Institute's committees, and been a representative of the Institute on 3 other bodies. Doctor Mailloux was particularly active on the International Electrotechnical commission, and on the U.S. national committee of this organization. For the U.S. national committee of the I.E.C. he had served as president 1914-24, chairman of the advisors on nomenclature, representative of the National Research Council on the division of foreign relations, and honorary president. For the I.E.C., he had been president 1919-23, director of the secretariat on nomenclature, and at the time of his death, honorary president. For the international conference on large electric high-tension systems, he had served as honorary president, acting also as United States delegate at recent biennial meetings. Doctor Mailloux had been a chevalier of the French Legion of Honor. He also had received honors in this country, included in which was the degree of D.Sc., from Lehigh University in 1914. Doctor Mailloux was a former editor of the Electrical World, having served during the early part of his career, and continued to be a liberal contributor to technical literature throughout his life. Largely through his efforts the electrical engineering nucleus of the present Engineering Society's library in New York had its origin. In 1903-04, he donated several volumes and subscriptions to technical periodicals to the library. He had been for many years an advocate of the use of a universal language to standardize technical terms throughout the world. This page was last edited on 14 February 2019, at 16:27.